When we started KO-OP in the summer of 2017, little did we knew where this journey would take us to. Ever since we had the pleasure to work with 21 artists from all over the world and have put out almost 80 tracks on lp, tape and digital. Now we are happy to share with you KO-OP 2 - a split album by two of our favourite producers from the UK: Slim and Joe Corfield. Slim is one half of London rap group Summers Sons. The Sons are signed to MPM where they have released two albums (“Undertones” & “Uhuru”). In February 2019 Summers Sons will play their first German tour together with Children of Zeus. Slim has released instrumental cuts on KO-OP, Brownswood and Banoffee Pie, plus a beattape on Yogocop Records. 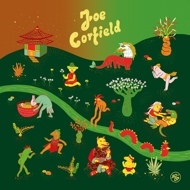 Joe Corfield hails from Birmingham and has released a string of albums via Radio Juicy and Yogocop. He is coming with his very own sound. Futuristic and soulful, with a great ear to detail. It was actually Flofilz' idea to have them both on one record. “KO-OP 2” will be released on one LP with two individual covers by Rahel Süßkind, a Berlin based artist (and part of Money $ex Records) who is responsible for all KO-OP artwork.